DETROIT -- As Ford Motor Co. has been developing self-driving cars, the U.S. automaker has started noticing a problem during test drives: Engineers monitoring the robot rides are dozing off. Company researchers have tried to roust the engineers with bells, buzzers, warning lights, vibrating seats and shaking steering wheels. They’ve even put a second engineer in the vehicle to keep tabs on his human counterpart. No matter -- the smooth ride was just too lulling and engineers struggled to maintain “situational awareness,” said Raj Nair, Ford’s product development chief. The struggle to prevent snoozing-while-cruising has yielded a radical decision: Ford will venture to take the human out of the loop by removing the steering wheel, brake and gas pedals from its driverless cars debuting in 2021. That sets Ford apart from most automakers including Audi and General Motors, which believe drivers can be counted on to take the wheel if an accident is imminent. BMW, Mercedes-Benz and Volkswagen AG’s Audi plan to roll out semi-autonomous cars starting next year that require drivers to take over with as little as 10 seconds notice. On a scale embraced by the U.S. government, these cars would qualify as Level 3 -- more capable than cars where drivers do everything, but short of full automation. Ford plans to skip that level altogether. The automaker has aligned with Alphabet Inc.’s Waymo, which made similar discoveries related to human inattention while researching Google’s driverless car. 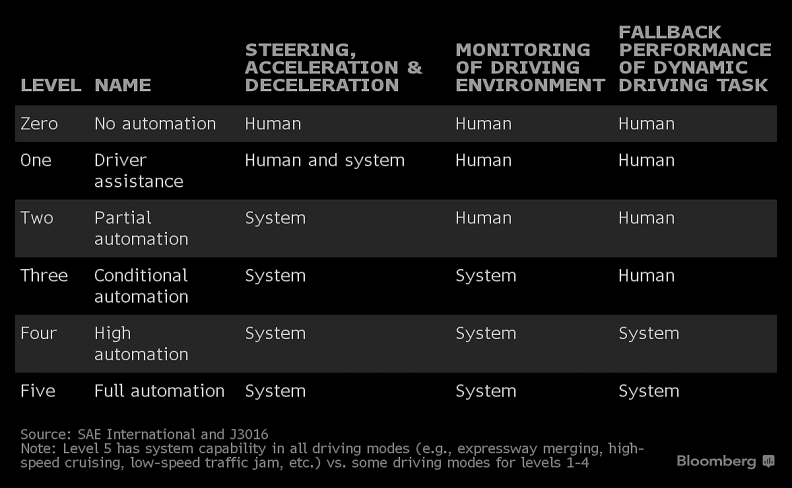 Ford and Waymo’s views show there’s a rift developing among the creators of autonomous cars over what role -- if any -- humans should play when cars begin driving themselves. Most automakers believe that, at least initially, people must supplant the robot to avoid crashes in complex situations. Others contend that asking an inattentive human to respond in seconds to a life-or-death situation is a recipe for disaster. Advocates of Level 3 contend a human backup is required for safety and to allow consumers to become comfortable with technology that will eventually take the wheel from their hands. Next year, Audi will introduce Traffic Jam Pilot, a Level-3 system that allows hands-free driving at speeds of up to 35 miles per hour. If the car’s sensors detect a situation that requires human help, it will give the driver 10 seconds to get hands on wheel, eyes on road, foot on pedals. If the driver doesn’t respond, the car will slow to a stop in its lane. Other automakers, such as Nissan Motor Co. and Honda Motor Co., have systems coming that will give drivers 30 seconds to prepare to re-engage and that can pull to the side of the road if the car doesn’t detect human hands on the wheel. That’s not how Hakan Samuelsson sees it. A person at rest or distracted by e-mail or entertainment can’t be expected to quickly take the wheel and save the day, according to the Volvo Cars CEO. No sensor exists yet that can predict far enough into the future to give a driver enough time to prepare to avoid a crash, he said. Volvo, siding with Ford and Waymo, will deploy a self-driving system in 2020 that won’t require human intervention. It’s now being tested as a robot taxi by Uber Technologies Inc. Volvo will outfit its self-driving XC90 crossover with a steering wheel that tucks away while in autonomous mode, but also allows its owner to drive manually for pleasure. Legal liability could be driving most automakers to put the wheel in the driver’s hands in an emergency, said Joe Vitale, global automotive leader for consultant Deloitte. Volvo has pledged it will accept responsibility for any crashes by its self-driving vehicles. Samuelsson said Level 3 could create confusion over who is legally liable for a crash. One matter both sides agree on is that too many requests for human intervention could wreck the autonomous experience. As part of its testing, Ford used sensors that monitor facial expression and track eye movement to determine if a driver was alert and ready to take over. This led to an unenviable experience in which drivers felt they were being constantly reminded to pay attention. “The car is actually yelling at you all the time,” Nair said. It also would undermine the value of having an automated chauffeur, according to Mark Fields, Ford’s CEO. On Feb. 10, Ford announced a $1 billion investment over five years in Argo AI, a months-old startup founded by former leaders on the self-driving car teams at Uber and Google.